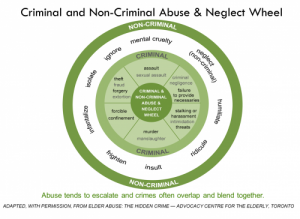 There is a lot to consider when identifying elder abuse and neglect issues. 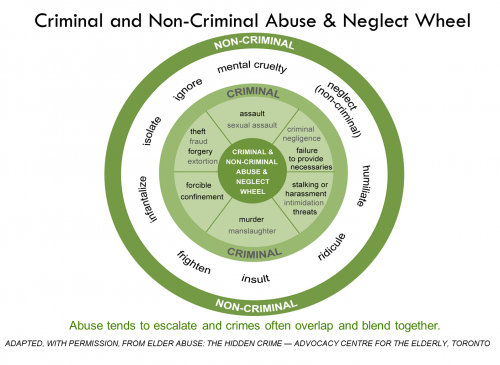 In BC there are specific types and guides to understand criminal and non criminal abuse. For more detailed information see our Understanding and Responding to Elder Abuse E-Book. The e-book is designed for workers in B.C. who work with older adults who have been abused and neglected. The E-Book covers types of elder abuse and risk factors, B.C. government programs and community services available for older adults who are abused and neglected, and practice tips on how to work with older adults who have been abused. 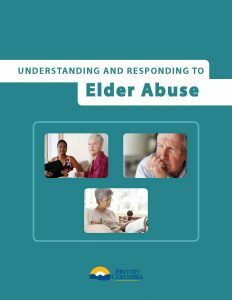 The E-Book also includes resources, information, links, video interviews with local stakeholders, and role play video scenarios on how to address different types of elder abuse. Click here to access the e-book. Note that this arises out of the context of an existing relationship of trust, relationships where there is an element of reliance, or someone within in a circle of closeness. Not all abuse is elder abuse. Elder abuse is different from situations where two people are in conflict with each other, may do things to hurt each other, and where fights can escalate to violence. It is elder abuse when there is an imbalance of power, when one person uses their power or influence to take advantage of, or to control, the older adult. Any act of violence causing injury or physical discomfort, including sexual assault. Unexplained injuries in areas normally covered (bruises, burns or bites). Signs of over or under medication. Any action or comment causing emotional anguish, fear or diminished self-esteem or dignity (e.g. threats to do harm, unwanted institutionalization, harassment, abandonment, imposed isolation, removal of decisions making choices). Fear, anxiety, depression, withdrawal, cowering. Fearful interaction with caregiver, caregiver speaking on behalf of person and not allowing privacy. Theft or exploitation of a person’s money, property or assets (e.g. fraud, forgery, misuse of Power of Attorney or joint bank account). Standard of living not in keeping with income or assets. Unusual or inappropriate activity in bank accounts, forged signatures on cheques. Forcing a person to sign over property or execute a will. Inability to provide basic or personal care needs (e.g. food, water, required medications, shelter, hygiene, clothing, physical aids, hearing aids, eye glasses, dentures, exercise and social interaction, lack of attention, abandonment, undue confinement, inadequate safety precautions, withholding medical services or treatment). Active Neglect: intentional failure of a caregiver to fulfill their care-giving responsibilities. Passive Neglect: unintentional failure of a caregiver to fulfill their care-giving responsibilities. Living conditions unhealthy, dangerous and/or in disrepair. Although not a form of elder abuse, it is the person’s inability to provide for their own essential needs. Unkempt appearance, inappropriate or dirty clothing, signs of infrequent bathing. 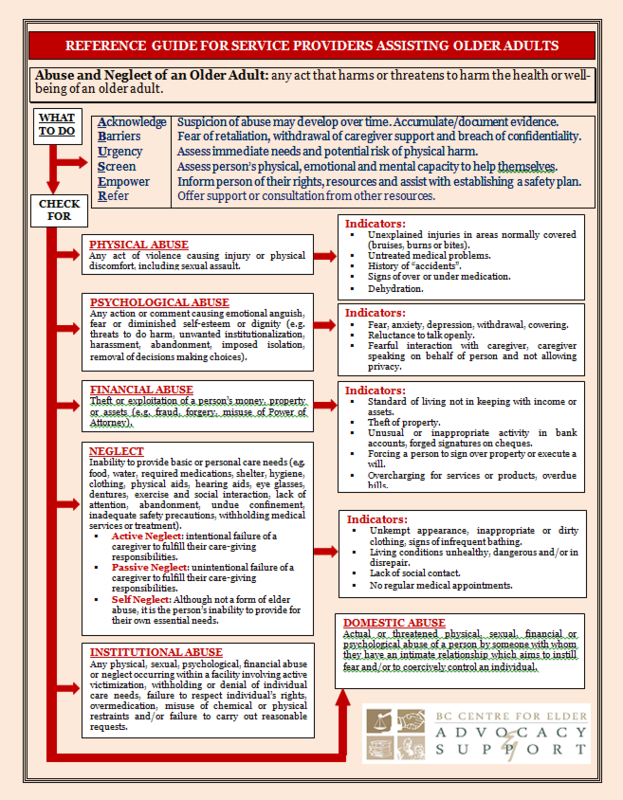 Any physical, sexual, psychological, financial abuse or neglect occurring within a facility involving active victimization, withholding or denial of individual care needs, failure to respect individual’s rights, overmedication, misuse of chemical or physical restraints and/or failure to carry out reasonable requests. There is little is known about the prevalence of physical elder abuse. A new National survey on the mistreatment of older adults in Canada by the National Initiative for the Care of the Elderly (NICE) should provide some important data. Estimates are that about 50% of physical abuse of seniors occurs in a spousal relationship . Often this is where there is a history of domestic violence that has often gone on for 25 yrs. or more. Acts of abuse tend to escalate – a continuum from infantilizing indignities to gross neglect to malicious assaults that lead to death. Financial abuse of seniors has been called “the crime of the 21st Century.” One study suggests one out of 12 (8%) seniors in B.C. have been financially abused – losing an average of $20,000! Another study by Vancity Credit Union suggests almost 50% of seniors have been victims of financial exploitation. Women make up 92% of older adults who have experienced financial abuse. not appear to be vulnerable in any way. Many of these family loans are undocumented, and the borrower may later claim it was a ‘gift.’ Luckily the law has a ‘legal presumption’ that these types of advancements from an older adult to an adult child are considered a loan rather than a gift, unless the adult child can show proof otherwise (e.g. – money was in a birthday card). For advancements to a minor child (under 19 yrs.) the presumption is reversed, it is presumed to be a gift unless it can be shown to be a loan. Powers of attorney can be seen as part of the solution for an older adult who is unable to manage their funds, but it can also be part of the problem. The most common form of financial elder abuse is a ‘rogue’ power of attorney – these documents have been called “a license to steal.” The attorney can literally bankrupt the older adult. For more information – see our page on Abuse of Power of Attorney. Similarly, setting up a joint bank account with someone may be seen as part of a solution, to help with banking chores and paying bills. Or it may create another “a license to steal” – each signer on the account is entitled to 100% of the money at any time. Again a legal presumption is that an adult child put on a joint bank account of an older adult has been put on for convenience and is a ‘trustee’ for the older adult’s money and not entitled to it themselves. When the older adult dies, the money would be part of the estate, rather than automatically going to the adult child (most joint accounts have ‘right of survivorship’ – automatically the property of the surviving account holder). The first consideration is always of course whether the older adult is in immediate danger – in which case 911 should be called. 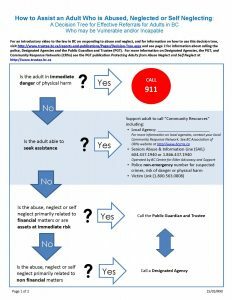 If it is not an emergency but the adult is being physically abused, neglected or is self-neglected, a referral may be made to a local Designated Agency under the Adult Guardianship Act (the Health Authorities are all DA’s for their areas – also Providence Health (for Catholic hospitals in Vancouver) and Community Living BC for their residents), or to the Public Guardian and Trustee for investigation and assessment if it is believed that the adult is incapable. Designated agencies are legally mandated to look into reports of adult abuse and neglect that they receive or become aware of. DAs can offer available and appropriate support and assistance. They are required to report criminal offences against an adult to the police. For adults who cannot get assistance on their own, DA’s can also use legal tools under the Adult Guardianship Act to protect the adult, which include 3 ways of gaining access (emergency access without a warrant) and restraining orders. The DA can apply for civil no-contact and support orders. If the older adult is refusing support but is assessed by the PGT as mentally incapable of making this decision, the DA can apply to court for a Support and Assistance Plan. This may include admission to a care facility, ‘services of PGT’ or restraining order, etc. 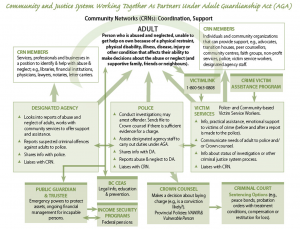 CRNs are groups of local people and organizations who work together to ensure an appropriate and coordinated response to adult abuse, neglect and self-neglect. CRNs around the province are reaching out to their communities to establish a network of community agencies, local businesses and government agencies (DA’s), to provide help for adults experiencing or at risk of experiencing abuse, neglect and self-neglect. Victim Service Workers offer victims of crime practical support and information. They assist victims and those supporting them to obtain info about status of police investigation or other criminal justice process. They can communicate information about the particular needs or vulnerabilities of an older adult to police or Crown Counsel. A safety plan for an older adult may include a change to an element of their environment or their relationship which could result in the elimination of the role of the abuser or context of the abuse. Keep phone numbers of friends, relatives, shelters or other trusted individuals handy. There are some obvious responses to financial abuse and the older adult is capable – for a rogue power of attorney, the power of attorney can be revoked, and another attorney appointed in their place. A joint bank account can be closed. Theft can be reported to the police. Vancouver and New Westminster police have special elder abuse units. other local community support services such as Seniors Tax Clinics and Credit Counseling Service [www.nomoredebts.org]. NOTE – even if a person is not capable of managing their own finances, they still may be legally capable of granting a section 7 Representation Agreement with routine financial management powers to someone else. Refer to section 8 the Representation Agreement Act for the test for capacity [www.bclaws.ca]. NOTE – The federal Income Security Programs can look into misappropriation and theft of OAS/GIS/CPP monies (including stopping or redirecting payment of benefits). For abuse of a power of attorney or representation agreement, referrals can be made to Assessment and Investigation Services (AIS) at the PGT. If the incapable adult’s assets are at risk, the PGT can freeze assets until it is clearer what the adult’s situation is, and can conduct an investigation. PGT may take over the older adult’s finances (‘public committee’) if no one else available or a concerned family member or friend may be appointed ‘private committee’ by a court order. Acknowledge – Suspicion of abuse may develop over time. Accumulate/document evidence. Urgency – Assess immediate needs and potential risk of physical harm. Screen – Assess person’s physical, emotional and mental capacity to help themselves. Empower – Inform person of their rights, resources and assist with establishing a safety plan. Refer – Offer support or consultation from other resources. 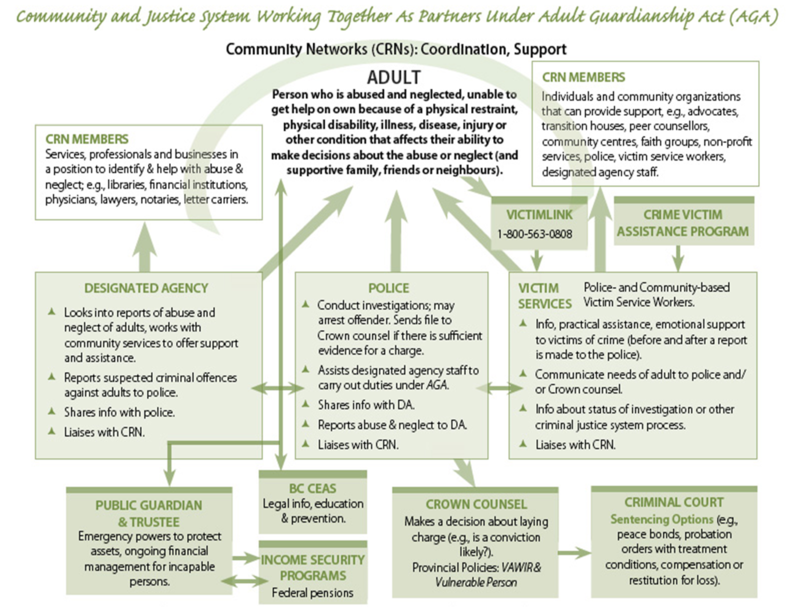 BC’s Public Guardian and Trustee’s office has prepared a useful “decision tree” to help with deciding where to refer someone who is abused or neglected. The front half is the decision tree itself, a flow chart of where to refer. The back contains a table setting out the response from the three resources – the police, the designated agency, and the PGT’s office. See the Decision Tree here: Decision Tree. The Canadian Bankers Association has prepared various resources to prevent and protect against financial fraud, such as information regarding credit card fraud, identity theft, password safety and more. Click here to access it.